Osteoporosis is a skeletal condition characterized by reduced bone strength leading to an increased risk of fracture. It affects 54 million Americans and 325 million people worldwide. In women, fragility (i.e., low trauma) fractures cause pain, disability and a higher death rate than heart disease, stroke and breast cancer combined In America, 1 in 2 women and 1 in 4 men over age 50 will suffer such a fracture. Approximately 24% of hip fracture patients over 50 years of age die in the year following their fracture and 50% are disabled in walking. The associated annual medical expenses will reach $25 billion in the US and €35 billion in Europe by 2025. Unfortunately, no FDA-approved medical device measures bone strength. So, since 1993, physicians have diagnosed osteoporosis by using Dual Energy X-Ray Absorptiometry (DXA) to identify individuals with Bone Mineral Density (BMD) T-scores < -2.5 at sites of predominantly trabecular bone in the spine and hip. The problem with this diagnostic approach is that BMD does not predict fractures well. Several studies have found that most post-menopausal women diagnosed with osteoporosis do not fracture, while most fractures occur in those diagnosed without osteoporosis. The largest such study of 160,000 postmenopausal American women found that 96% of those diagnosed with osteoporosis (11,397 of 11,806) did not fracture during the observation period, while 81% of fractures (1,757 of 2,166) occurred in those diagnosed as not having osteoporosis. Another site-specific study found that only 10% (heel) to 44% (clavicle) of fractures could be attributed to osteoporosis. (1) Unnecessary preventive care is administered to patients diagnosed with osteoporosis who would not fracture. Indeed, because fracture prevention medications are administered for many years to patients who do not need them, the cost of preventing a fracture has been estimated to be 6X the cost of treating one. (2) Fracture treatment is administered to non-osteoporotic patients who needed preventive care that they did not get. 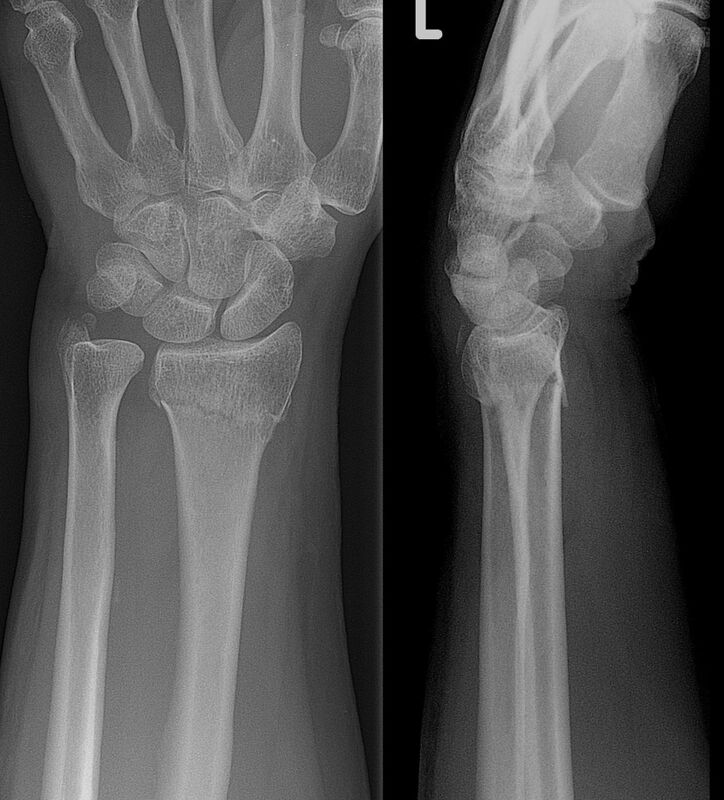 About 80% of fractures after age 60 occur at non-spine, mainly cortical sites, with 50% percent occurring in the arm. Among 51,000 women over 55 years of age in 10 countries, there were five times more non-hip, non-spine fractures requiring twice as many days of hospitalization, rehabilitation and nursing home care than hip and spine fractures combined. Thus, a new diagnostic tool is needed to assess the strength of cortical bone. To better identify individuals needing fracture prevention care, many physicians now decide who to treat by assessing clinical risk factors for fracture. The most common assessment tool is the web-based questionnaire FRAX®. Since 2011, the FRAX® web page has recorded 8000 such assessments per day. Yet, a recent prospective study of post-menopausal women in France found that 74% of the women identified by FRAX as being at high risk did not fracture during the follow-up period, while 82% of fractures occurred in women identified as low risk (19). Combining BMD and FRAX only reduced these errors to 69% and 62%, respectively . Ambiguity about the location of the boundary between true trabecular bone and “trabecularized” cortical bone at the imaging sites. Reference Point Indentation (RPI) is an invasive hardness test of cortical bone. In RPI, an incision is made down to the bone, the periosteum of the bone is removed, a small stylus is driven a short distance into the cortical bone surface, and the resulting depth of indentation is measured. The technique has been extensively studied (22), and it has been able to detect significant differences between cohorts in clinical research, but these measurements have been only weakly associated with any mechanical property of bone (R2 < 0.33). Missing from all of the diagnostic approaches described above is a direct measure of the mechanical properties of cortical bone under dynamic loading conditions. The Total Available Market for a more effective diagnostic technique is the existing market for DXA systems, with 10,000 annual sales to 70,000 medical facilities worldwide projected to reach $940 million by 2020 (27). The Serviceable Available Market is the 21,000 medical facilities located in the USA. AEIOU Medical is developing a CBMT Medical Device to serve this market. National Institutes of Health Consensus Development Panel. Osteoporosis prevention, diagnosis, and therapy. Jama. 2001;285(6):785-95. Bohannon J. Osteoporosis’ Silent Risk. Endocrine News. 2013:16-8. National Osteoporosis Foundation; [Available from: http://nof.org/articles/7. Leibson CL, Tosteson AN, Gabriel SE, Ransom JE, Melton LJ. Mortality, disability, and nursing home use for persons with and without hip fracture: a population-based study. J Am Geriatr Soc. 2002;50(10):1644-50. Magaziner J, Simonsick EM, Kashner TM, Hebel JR, Kenzora JE. Predictors of functional recovery one year following hospital discharge for hip fracture: a prospective study. J Gerontol. 1990;45(3):M101-7. Peck WA. Consensus development conference: Diagnosis, prophylaxis, and treatment of osteoporosis. Am J Med. 1993;94(6):646-50. Bolotin HH. Inaccuracies inherent in dual-energy X-ray absorptiometry in vivo bone mineral densitometry may flaw osteopenic/osteoporotic interpretations and mislead assessment of antiresorptive therapy effectiveness. Bone. 2001;28(5):548-55. Boutroy S, Zebaze R, Sornay-Rendu E, Seeman E, Chapurlat R. Bone mirostructure identifies women without osteoporosis suffering fragility fractures: the prospective OFELY study. ASBMR Annual Meeting; October 9-12, 2015; Seattle, WA2015. Global Industry Analysts. Bone Densitometers – Global Strategic Business Report. Market Research. 2014 1 September 2014.